Do yellowjackets harm bees or help them? Just as the blackberry nectar bloom is in full spring, someone has decided to spray a slope covered with blackberries with an unidentified herbicide with a noxious odor. So much spray that the leaves are wet with it and it is dripping down into the storm drain below. This is plain old fashioned ignorance. You can legally cut back blackberries any time of year but it is against the law to spray when the bloom is on– Oregon State Department of Agriculture rules. I placed a notice at this site and will look up the owner and notify them. Meanwhile bees are busily working the blackberries adjacent to and uphill from the spray and even some of the sprayed berries. The good news is that no spray next door this year means the bees I hived as a replacement for those I lost last year are doing just fine. A good many bees were zipping up into the filberts overhead to get pollen– and there was a bit of a traffic jam on a little bunch of crocuses nearby as well. This hive has quite a stock of honey left yet, and they seem more interested in pollen than nectar– a sign they are building up their brood for the coming spring. Though there is also not much blooming currently and I did see a bee working my sarcococca a few days back, they haven’t yet taken up with my daphne, which is also beginning to open up. Both gorgeous smelling early bloomers. In a couple of weeks there will be much for the bees to choose from as my fruit trees come into bloom beginning with the cherry. I did check this journal from last February and noted the osoberry and heather are not out yet as they evidently were last year. The bees were zooming out of the hive by noon (they took to 56 degree mid-February sunshine) and were working late into the afternoon. It was ALMOST like a spring or summer day’s coming and going– just fewer bees. Bees of all species are everywhere! There is good news and bad news. I lost all three of my hives– evidently to pesticide poisoning– a neighbor hiring a pesticide operator to spray a yellowjacket nest– which I did not find out about until several months later. Pesticides do not always kill the bees outright, but weaken their immune or navigation systems. I lost the hives one after another, about two weeks apart. IF you must apply pesticides, let your neighbors know so that they can protect their bees by closing up their hive for a time. Even if your neighbors do not have bees, they may want to protect their children and pets. See the “Do not Buy List” for more about this issue. It turns out that neither this neighbor nor the landscaper knew the difference between bees and yellowjackets. I have even heard an Oregon park ranger call a yellowjacket a “bee”– it is not. It is a hornet. A very different creature. If you are stung by something that does not leave a stinger, you can be sure you were not stung by a honeybee. Honeybees away from their hive are also exceedingly mellow unless you happen to squash one by mistake. 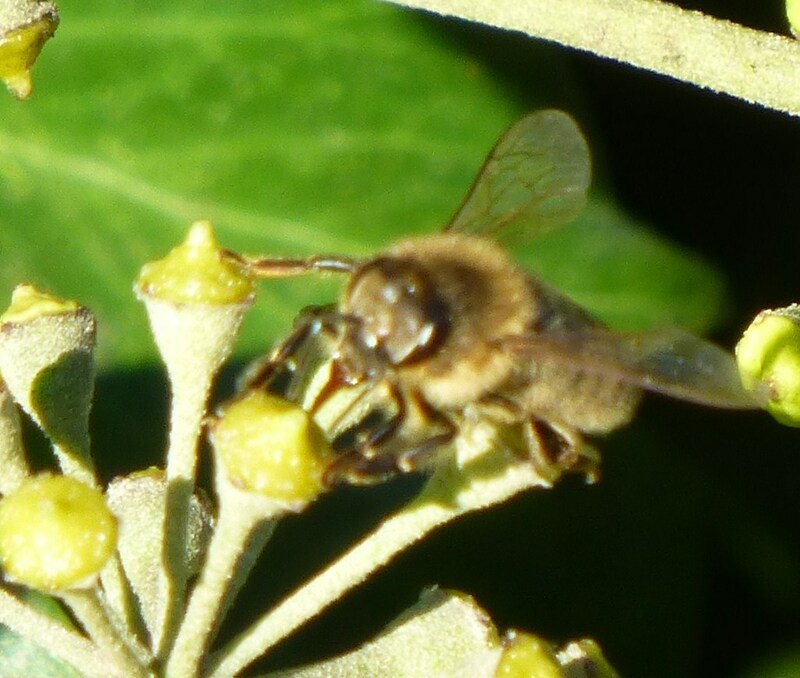 They are about their business collecting nectar and pollen when they are out and about. It is only near their hive they get protective. Spring! Well, almost. It is mid-February and when the temperature hits fifty degrees (or nearly) the brave bees venture out, both spinning upwards to take their cleansing flights and even checking out a few pollen and nectar sources. I loved seeing the bees rolling in the pollen of crocuses in my yard, since collecting pollen means they are taking it back to brood, readying for the population explosion that is hopefully coming with spring. Yesterday the sun was shining, it was 55 degrees and I noticed the bees working a few blooming plants around: besides the crocus, they were on osoberry, heather, sarcococca, and early rosemary blooms. Though the pollen has been heavy on the filbert trees, I haven’t noticed the bees going after it as they sometimes do. An afternoon shower must have caught some of the few explorers. But I saw many flying back to the hives anyway. Soon the plums and peaches will be in full bloom followed by the other fruit trees and there will be plenty to work. Unfortunately, they also have to deal with the uncertainties of the Willamette Valley weather this time of year. Rain and cold can come on the heels of sun and mild days– or a week with cold rainy days and freezing nights following mid-fifties weather that coaxed out some blooms and the bees with them. Now is the time to make sure they still have honey stores to keep themselves warm and dry and feed them if they don’t. My two surviving hives coming into spring seem to be doing quite well, though I watched impatiently for activity at the hive entrance when the weather turned warm, having lost a hive earlier in the winter to something mysterious. One of the hives is in a Langstroth hive like that pictured below, a wonderful hive I got as a swarm late last spring. The second is in one of David Stuckey’s/ Amazon Bee Co-op’s top bar hives, which is great in keeping the bees warm and dry. These northern California bees with a Minnesota hygienic queen (bred to clean out deformed brood to help the hive be resistant to mites since I don’t use chemicals on my hives) built up well and made a great honey crop even in the first year. Philip Smith brought the bees up from California early last spring and has heard good things from everyone about them! Now and again a bee flies into or out of the hive and lands ungracefully upside down. She will twist and struggle and usually right herself. But sometimes it looks as if this is not going to happen. Twice I have seen a bee continue to struggle until it seemed that she was just not getting up. And both times bees continued to fly in and out of the hive totally ignoring their beached hive mate until – until some bee coming in or going out paused long enough to grab hold of the struggling bee and help her right itself. Took only a fraction of a second – hardly enough to interrupt the helper bee’s flight path. Such cooperative behavior– which seems to be thought up on the spot– gives use pause in terms of evaluating the intelligence of these creatures. Soon after I got my hive there were a number of drones hanging out on the hive’s “front porch” in the late afternoons each day. An experienced beekeeper said the presence of so many drones (maybe one of a hundred of the bees present) meant the hive was ready to swarm. They would hang out and sometimes take off and come back quickly—likely for a “cleansing flight” to defecate, since bees evidently won’t do this in the hive. But now I rarely see a drone. I don’t know where they went– my bee friend says they may have swarmed already and I didn’t see it (I was gone for a few days), but the hive doesn’t seem depopulated. In fact, it is clipping along at quite a pace. I just put my fourth “Western” super on, at the point when the third was beginning to be built out in 6 of 8 frames (this was the addition point suggested by another experienced beekeeper. As the summer population builds and nary a drone is in sight anymore, I am guessing some disaster may have befallen their queen early on and they set about working to get themselves a new–and very fertile– one. All those drones were likely a sign of supercedure rather than a swarming impulse. Bee massage or mite removal? It would be a hopeful thing if European honeybees were earning to take mites off one another as do Africanized bees. Here is my observation: There was one drone out yesterday and at least two workers were riding it and trying to pull something from it—though it really did not want to hold still. I couldn’t see whether they were trying to take off a mite. I have seen them do the same thing to a handful of other female workers. In the latter case, the females were quite willing—indeed seemed to court the attention. I understand that bees also sometimes “massage” one another, but I don’t know whether or not it takes the form of this aggressive scraping and pulling on another’s back. Since getting my bees, I have taken a number of “pollen” walks—looking for bees on flowers within about a mile radius of my hive (they will fly up to six miles to search out pollen and nectar sources). Since there two other hives in this circuit, all the bees I have seem are obviously not mine. 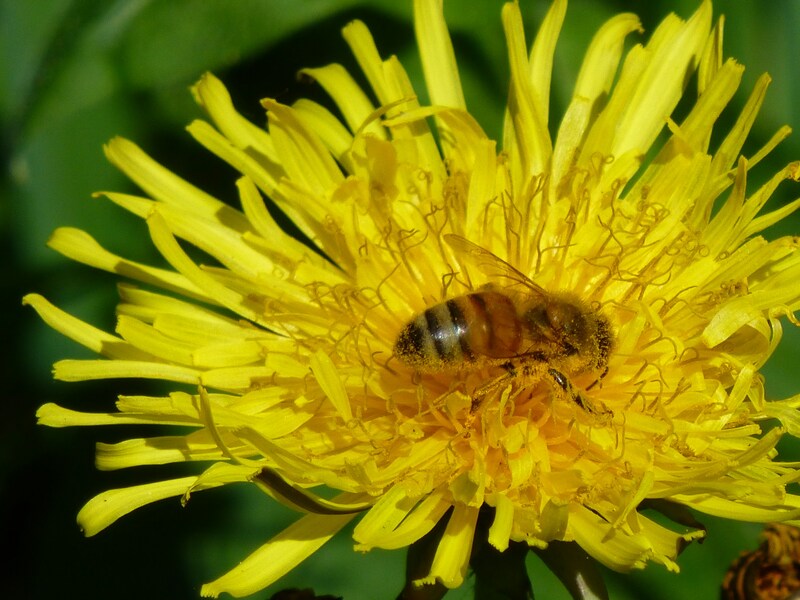 Still, the variety of what the bees are working may indicate that there is some nutritional deficit link to colony collapse disorder among bees with single nectar/pollen sources. If given a choice, they don’t stick to one source, no matter how rich. Though there are nectar sources on which I will always find a bee—a brave bee even in the chill early morning or the rain in the abnormally rainy spring we had. There is the mountain bluet and sage and lavender—and of course, the evergreen huckleberry—and the blackberry. The bees serviced the huckleberry to the very last bloom beside the native bees who love these flowers as well. These and flowers like the sage may have been harder for the bees to burrow into—but on the other hand rain also could not wash out the nectar of the downward facing bell shaped huckleberries or the sage with its tunnel to negotiate. On rainy days pollinating the huckleberry was like working under a little umbrella. Blackberry stands on an empty lot nearby and a few blocks away and along Amazon Creek are filled with bees—but only after mid day: it might be the sun brings out the sweetness of the nectar. But perhaps they are only following the light, since there are bees on every one of the dozens of blackberry stands, no matter how large or slight, that I have stopped to view. The sun-facing flowers get arge numbers of bees, but the others all have their devotees as well. I saw the same thing when the butterfly lavender scattered throughout my neighborhood was in bloom. A large gathering of plants might have a large number of bees, but every single plant I found up to a mile away had at least one bee on it. I can imagine this as part of the ancient pollinator contract in which all flowers were honored with at least some bee visits so that they could come to seed, providing the variety necessary for natural selection. On June 15, my bees—or honeybees near my house– were gathering nectar and/or pollen from mountain bluet, sage, lavender, blackberry, raspberry, blueberry, ceanothus, Chinese bells, black locust, daisy (that is Willamette Valley daisy near the open meadows by Amazon creek—I have yet to see a bee on a Shasta daisy), clover, clematis, bellflowers, elderberry, pea, and poppy. And I am sure this is only a partial list. Two weeks earlier, they were gathering from lunara, chestnut, forget-me-not, huckleberry, pyracantha, Scotch broom, hawthorn, bluet, butterfly lavender, cherry laurel, dandelion and clematis. Now (mid July) the profusion of blackberry is just waning and lavender and other herbs like oregano, thyme, and mint , as well as bachelor buttons are coming on, calling to the bees. 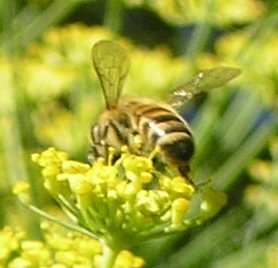 Besides these, in the past two days (July 19) I have seen the bees working in large numbers on fennel (see photos) in concert with a half dozen kinds of native bees, as well as germander, borage, African impatiens and vetch. From some of their sources, they seem to gather only a tad, like seasoning in a complex bouquet. The clematis visits, for instance, were very spotty and the poppies only a little more frequent, while they loved lunara and bluet and of course, lavender, locust, those berries–and now, the fennel they–and scores of native bees alongside them– adore. By August, the bees are shifting their map of the neighborhood once again: as the blackberry blossoms fade, they concentrate on fennel, mint and false dandelion, along with herbs like oregano, lavender, mullein, borage, and germander, and flowers like salvia, mums, bachelor buttons, gloriosa daisy, and cosmos. Bee after bee comes loaded with the bright orange pollen of false dandelion and also from the red flowers of the sedum in a neighbor’s front yard rock garden. 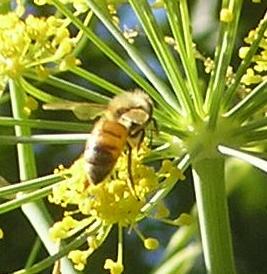 As the dryness of summer wears on, their visits to the small pond near their hive are more and more frequent. You can watch them tucking their heads into tiny pools amidst algae or floating flowers where they land, flapping their hind ends furiously up and down, as they stuff themselves full of the precious liquid to carry back to moisten their hive’s honey with–and with which to help cool their hive when the temperatures soar. Good think they are adaptable as it rises into the nineties two days in a row and then falls to forty-one degrees at night and a high temp of sixty-nine the next day. I have watched bees working amidst a profusion of different flowers like those in the school garden at Parker Elementary—but I have never seen a particular bee visit more than one kind. She will fly over several other plants to visit the mint or borage or African impatiens that is her focus. Another thing: I understand that the smell of lavender repels mites , which may be one reason why the bees so enthusiastically work first the butterfly lavender and then the regular lavender. Mint and thyme, bearing other anti-mite oils, are coming on soon. A week ago I saw a bee methodically moving along the tops of lemon balm plants at least two weeks away from blooming, touching each in turn. There is a bit of Jewish folklore that states each plant has an angel whispering, “grow”. 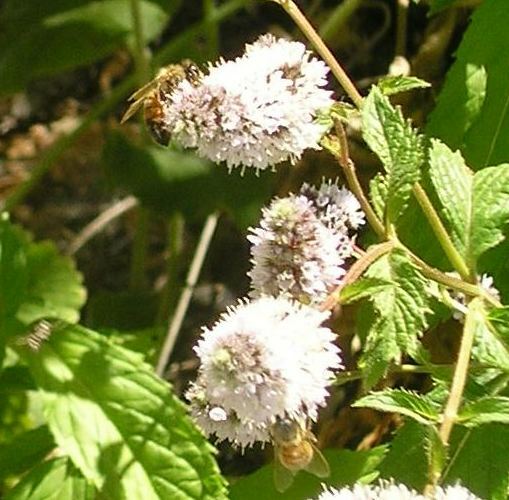 Perhaps in the case of the lemon balm, that angel is a bee, whispering “bloom”. I read research that indicates that the presence of pollinators actually incites more and earlier blooms in certain plants. On those late summer afternoons when the sun is slanting onto the hive, great numbers of bees sometimes flock outside the hive. Either they are REALLY busy foraging at that time or these are “practice flights” for soon-to-be foragers. Amidst the organized flights of the regular foragers coming and going, these younger bees spin into the sky and around and back down, learning to orient to their territory. At first I thought they might be going to swam—but they are back in the hive again within an hour–and this happens on a consistent basis. 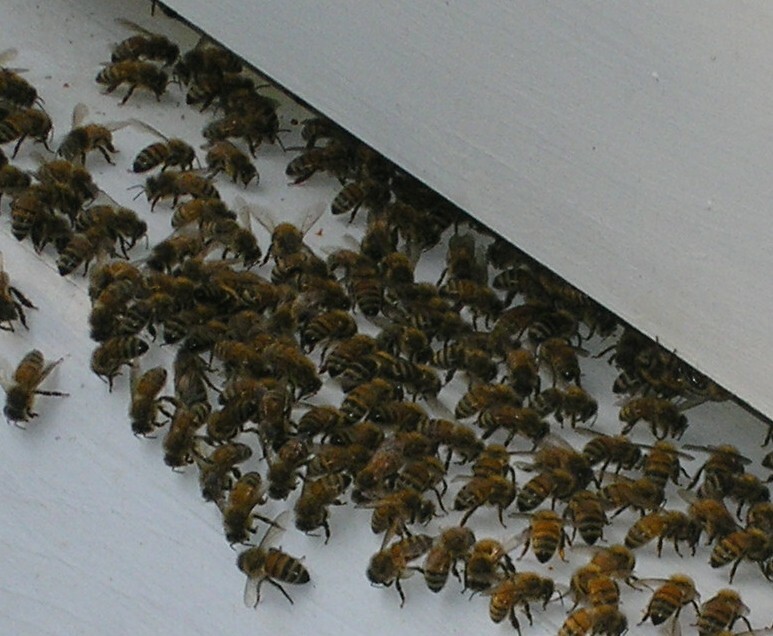 As the summer wears on, there are fewer bees gathered on their landing strip/front porch. Instead, if you stand in front of the hive (as I did) and peer in, you will see fuzzy strips of gathered bees bunched along the entrance. Toward the end of August, there are a few unrecognized bees evidently from other hives trying to make their way in–to rob the hive of honey as natural nectar sources decrease, my knowledgeable beekeeping friends tell me. But this hive is now strong enough in numbers to repel the one or two strays I see flying toward the vent hold near the top of the hives. The circle is stuffed with bees and should a stay attempt entrance, one of them flies out and butts it in the head, turning it around in one efficient movement. I haven’t seen any bee try this twice–nor have I seen them ever even try the lower entrance stuffed with hundred of hive mates. Unlike David Stuckey’s bees (of the Amazon Bee Co-op), who formed a fuzzy blanket over the entrance on the summer night of the bee co-op potluck (as, he says, they regularly do), my bees are still coming and going on these warm summer evenings until it is too dark for me to see them. Most of the bees are coming home at dusk, but there are a few intrepid bees still taking off as darkness falls. How they find their way back to the hive, I don’t know, since everything I have read says they orient by sunlight. Wouldn’t it be fascinating if they navigated by star light or moonlight as well? Yet another reason to follow Eugene’s night lighting guidelines and allow the stars their place in the darkness we protect as we should other aspects of the natural world. I watched a blue jay swoop down and scoop up a mouthful of bees. I am not sure how much total hive loss this accounts for. It seems to me that when blue jays are in the neighborhood, the bees’ flight patterns become more erratic. 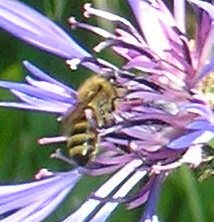 Instead of “beelines”, they go spinning and twisting to their destinations, and a some are starting to go closer to the ground diving amidst plants before they fly up and away. However, as the summer progressed, I noticed that this behavior only lasted and the bees were soon flying their beelines again. Notably, I haven’t seen any more jays around the hive. What happened to cause this change, I didn’t observe. I have the smallish “Western” Langstroth hives and I am placing new supers on the top. I may well be doing it all wrong, but there is one interesting thing to relate. When I put my last super on, we (my daughter and I) had drilled a hole for ventilation in the front (about 1” in diameter, as suggested by some of my bee books). There were a few ragged edges from the drilling. No sooner had I put on the super than a few investigating bees (I was still peeking in the top) came up into it to check things out—noting especially the rough edges in the vent hole. By the next day there were no rough edges: the bees had taken them away and spruced up the new super just the way they like it. I like to think they are curious or even appreciative as they stretch out into new quarters. I know I am anthropomorphizing, but that doesn’t make the bees any less fascinating. And just suppose our stance in the natural world was to pollinate it as they do? Certainly we would have avoided much environmental wreckage if we followed the same kind of contract between ourselves and our world as the bees follow with the flowers. I noticed a half dozen yellowjackets flying their methodical zigzag patrols under the beehive around the first of August. I also noticed that a bee that misses the landing platform and lands on the ground instead is swarmed by the yellowjackets and eaten. As the yellowjacket numbers increase, I wonder if they pose a threat to the hive. But two weeks later, there are more yellowjackets, but a subtle shift in their behavior–an equilibrium of sorts. I see two live bees miss the landing and fall to the ground, but the yellowjackets simply ignore them. Instead, I see a housekeeping bee fly down to the ground with a hefty dead drone body in tow and make a general fuss until a yellowjacket notices and grabs the bait–and the housekeeping bee lifts off back to the hive. Soon two other dead bees are dumped overboard and cleaned up by the jackets in short order. Now the bees don’t have to fly a distance away with their dead to clean their hive– they have a garbage clean up service on site– which serves the double purpose of feeding the yellowjackets dead rather than live bees. This is the first year of the hive and the weather has been poor bee weather this year, but still my experienced beekeeping friend Phillip peers in, hefts the hive to estimates its weight and deems it safe to gently brush away the bees from five frames to extract the honey from. A week later, Phillip leaves a gallon jar of rich dark honey on my front porch that my neighbors say is the best honey they have ever tasted. I won’t argue. I imagine I taste the bouquet of summer in the rich sweet stuff. And as I pick the fat blackberries I had watched the bees pollinate, I feel a surge of gratefulness to those little creatures responsible for this gift. There is information here on “top bar” hives and becoming a “bee guardian”. Lane County Beekeeper’s Association is a great organization, offering information-stuffed meeting and mentoring for new beekeepers. 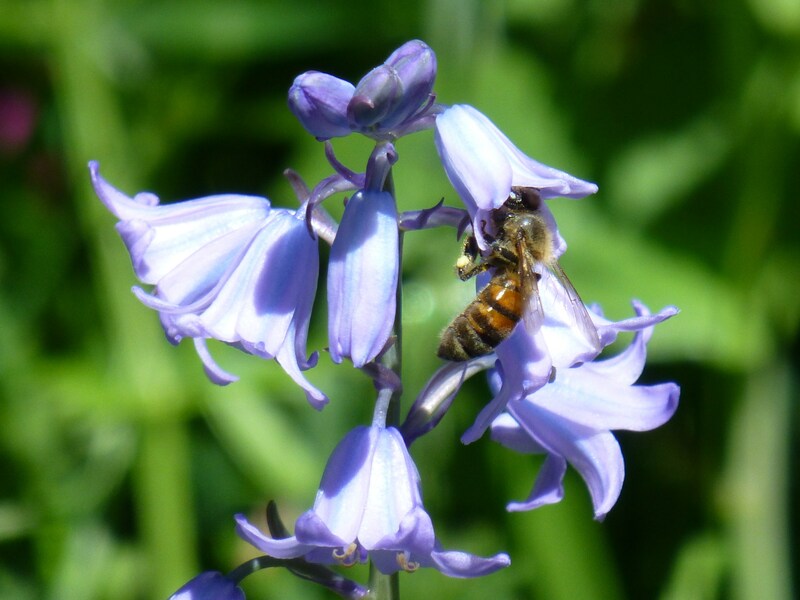 Now you also have the opportunity to visit the Oregon Sustainable Beekeepers online. There is some good info on this new website. They are based in Eugene: join up if you want to help with projects like community education to protect bees from pesticides. Feel free to link to text or photos, but all this material is copyright, 2010 and cannot be reproduced in any form without permission. This week I have the existing opportunity of conducting a vegetation study in Rocky Mountain NP, and what I learn will be weaved into an existing study on native bee populations in the alpine meadow ecosystem. I even get to collect data from an existing data site! It strikes me as odd that NPS didn’t conduct a site-specific study of the vegetation prior to publishing data on honey bee and wasp populations (with insect research sacrifices). I went to your blog for inspiration, and found this post and the Quote of the Week particularly helpful to my mood. While I am only an independent researcher and volunteer at this point, and I do not have to feel these sympathy pains for the unspoken victims of science. Rather, I have a responsibility. My only hope is that my contributions to this study can reflect a method that does not smash forbs, grasses, and shrubs, but also protects and promotes the legacy of our insect relatives. Thanks for everything! Always good to hear from you, John. Thank you for sharing this important perspective and for your important personal research. We need documented holistic perspectives such as the study you are putting together here! I think it essential that our science entails respectful observations concerning the interdependent nature of the ecosystems that sustain us. Nothing gives me a greater sense of peace than watching many species of bees, butterflies, dragonflies and a hummingbird or two visiting a tiny parking strip with a mix of flowers! It is amazing to me how many species visit a tiny strip planted with a dozen varieties of flowers. How many more must come to the meadows you are surveying. Thank you so much for writing this. I found you looking for natural ways to live in harmony with yellow jackets. I’m a first year beekeeper and I’m finding the yellow jackets in front of the hive but instead grabbing honeybees from the landing or out of the air. I’ve been reluctant to set traps for yellow jackets because I’ve found all the insects living in harmony around my veggie garden over the past few years and the bounty is beautiful aphid and worm free food. But even spiritual beekeepers are participating in trapping yellow jackets. I recognize my bias at finding a way to live in harmony with these creatures, but that feels like universal truth to me. I hope you still comment on these posts as I’m looking for more of your experience with yellow jackets and honeybees living in harmony. Yellowjackets have a special place in our ecosystems, and they don’t bother us or my beehives regularly. But if they are grabbing live bees out of the air as they come from your hive (f I understand you correctly), you might want to consider setting traps to take some pressure off of your hive. Traps won’t take out a yellowjacket queen at this time of year, so you don’t have to worry about taking them down entirely. Since I wrote this essay on yellowjackets, last year we had a beehive plagued by yellowjackets– or at least so we assumed from the rate at which they were flying into the hive, but it was a weak hive on its way out. Still, it was not easy to witness their moving into the hive. This year we have traps out, since we have a yellowjacket nest very near one of our hives, though thus far the yellowjackets have not gone into the hive. As for our own current situation, the dry months when the yellowjacket nests build up is coming. Also, we have a new kind of yellowjacket in the Pacific Northwest since the 1990s, German yellowjackets that migrated here via human ships and are more aggressive and inclined more toward building nests in urban environments. Though that point may just be an excuse for my trapping some of them out this year. I appreciate your work in making a harmonious garden. Hard decisions to make! In my sense of things, the very best thing you can do is keep pesticides and herbicides out of your garden. Have you seen our Oregon Sustainable Beekeepers Site (http://oregonsustainablebeekeepers.org/)– though we don’t have anything about yellowjackets. Congratulations on entering beekeeping! Let me know how things work out for you. I am doing my own best to get good genetic stock, since I have chosen not to treat my bees. I have German Yellowjackets. For now I’ll trap. I’m eager to find another solution long term. Thanks for the link! Hopefully we’ll run into each other via bees. Next spring I think I might try something I’ve recently heard of– a decoy nest. Since yellowjackets are very territorial, they won’t nest where they think another is already nesting. And one note about trapping. Don’t place your trap too close to your hive, as you want to lure yellowjackets away. About 20 feet is a good distance. Good luck with your bees this year!